"The definition of the word layering to me is the art of putting on many clothes that results in a look that is sophisticated and fine! The trick is to to mix different fabrics and lengths, don't go too bold on colors or print. You can create endless outfits by simply combining a few basic pieces. Women of all heights, shape and sizes can wear layers but you must keep balance in mind when you are selecting your pieces. If you have flowing, loose pieces on top, you should keep a straight, and/or fitted silhouette on the bottom. Conversely, if you have a flowing bottom layer, keep a simple, streamlined look on top." We have created a group of layered looks from just seven pieces to show you how you can wear simple pieces in so many different ways. Here we have selected black essentials with one printed addition which tend to look more similar, but if you switch up your Essential layering piece colours these looks would look like brand new and complete outfits each time. Simple tricks like changing the length of your skirt (our Pencil Skirt can be pulled higher or lower to adjust the length for the right silhouette for each outfit) or buying reversible/ two in one pieces can really extend the versatility of your pieces. Lousje & Bean Leggings- Choose from our Print Leggings, C'est Moi Bamboo Leggings, or some of our styles exclusively sold in store. In both 1a and 1b the same pieces were used. Our Pencil Skirt is layered with an A-Line Tank and topped with our Two Way Poncho. These images show how this piece looks on both sides with 1a being a colour blocked, solid look and 1b showing a pop of colour on the shoulders in the reverse position. In our second look we have again showed how the same pieces can look very different when worn in reverse. Beginning with our Cora Dress as a long base layer and adding our Two Way Poncho, there are two options to explore. 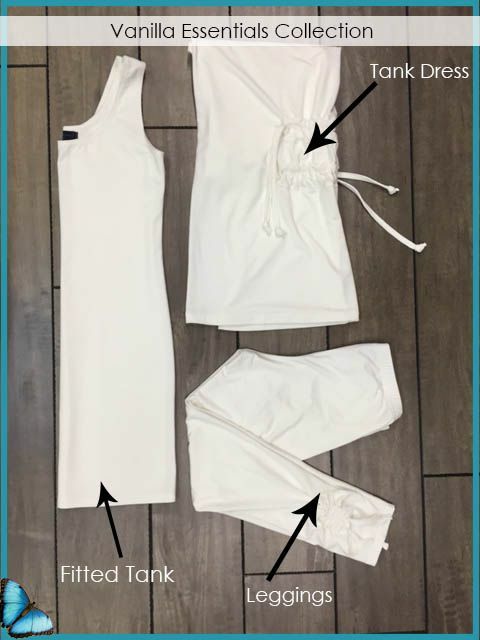 We stripped down our Essentials to show you how they can be worn together for a streamlined look and if you want to add pieces to these, the options are endless! 3a is our A line Tank paired with a Pencil Skirt. This is a great example of how a flowing silhouette is so perfectly complemented with a fitted foundation. 3b is our Fitted Tank paired with our Pencil Skirt. This is a flattering, fitted profile and is the perfect foundation to add a cropped jacket or flowing Kimono/Poncho on top. 3c is our Cora Dress in Black, long and lean, this is the most amazing base layer that can be dressed up or down depending on what you pair it with. Add a blazer for a daytime work look or layer on the jewelry and a dressed up jacket for a night on the town. We started with our Leggings and added a long Fitted Tank and Two Way Poncho to make this look cozy and casual with just a pinch of colour. The longer length of the tank and the added coverage of the Poncho makes wearing leggings as pants completely acceptable. Score another point for layers in giving us so many comfortable yet chic options! If you love these looks but want to switch up the base layers, your prayers are answered! We are excited to launch our new Vanilla Essentials Collection, coming soon online and in store at the boutique now! We are so ready for our summer whites, so bring on the sunshine!